Oh dear! 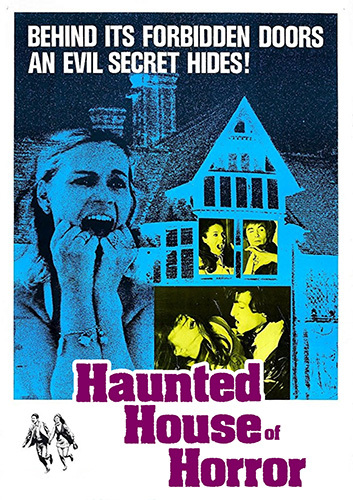 This dated 1960s Tigon/AIP horror is embarrassingly bad, yet bizarrely enjoyable for its kitsch value. Beach Party‘s Frankie Avalon swaps his shorts and surfboard for some Carnaby Street clobber as the jaded group’s nominal leader. 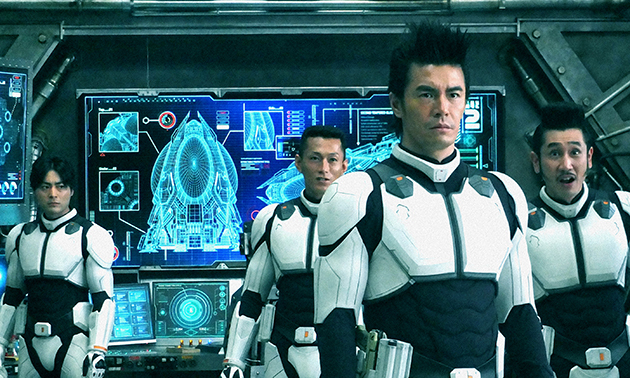 But he looks way older than his character should be, and practically dials in his performance. But he’s certainly not as stiff as Dennis Price (a last minute replacement for an ailing Boris Karloff), whose police inspector does little more than take phone calls. Among the dolly birds and male model supporting cast are future sitcom stars Richard O’Sullivan and Robin Stewart, pop singer Mark Wynter, and actress Jill Haworth (who ended up in Tower of Evil and The Mutations). 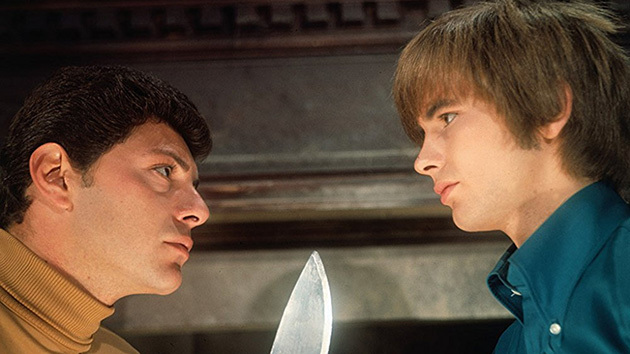 For fans of vintage British horror, you either love or hate this deeply-flawed attempt by Tigon to craft what is probably the UK’s first teen slasher, and its production history is certainly way more interesting than the film itself. Originally called The Dark, it was based on an original screenplay by 23-year-old Michael Armstrong, who also got to direct until he was removed by Tigon’s AIP co-producers, who demanded cuts, script changes and reshoots, to the point that the finished product looked nothing like what Armstrong had originally intended (he want to make a satire on the youth scene). Hence why George Sewell’s scenes look like they come from another movie. They were added to make up the running time after big cuts were made, which got rid of a homosexual subplot and other more interesting elements. The restoration, however, is impressive as it really highlights the effective camerawork and lighting, particularly so in the mansion scenes (shot on location at the Birkdale Palace Hotel in Southport, but using sets constructed to look battered and aged). There’s so much more detail now and the colours really pop (especially in the cast’s trendy attire). Check out the clip below about the restoration work (But BIG spoiler alert! The killer is revealed). 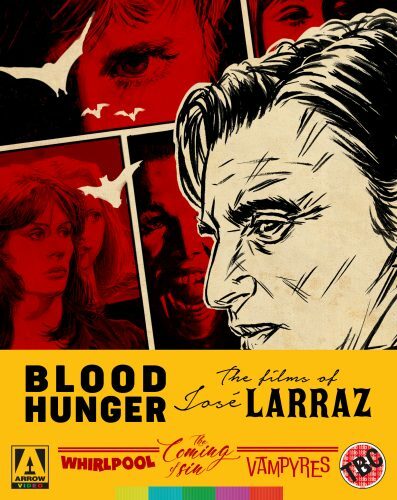 While the film ended up generating good returns (especially when it was released in the US as Horror House on a double-bill with Crimson Cult – aka Curse of the Crimson Cult) it’s a real pity its a dog’s dinner of a thriller. But one can only imagine how it could have turned out had Armstrong had achieved his original concept with his dream cast of David Bowie, Scott Walker, Ian Ogilvy and Jane Merrow. If you want to read Armstrong’s original screenplay for The Dark, you purchase it from Paper Dragon Productions for £13.99. Just click on the link. • Interview clips with Michael Armstrong, actors Mark Wynter, Carol Dilworth and Veronica Doran; plus hair stylist Ross Carver, camera operator James Devis, production secretary Jeanette Ferber, dubbing editor Howard Lanning and editor Peter Pitt. 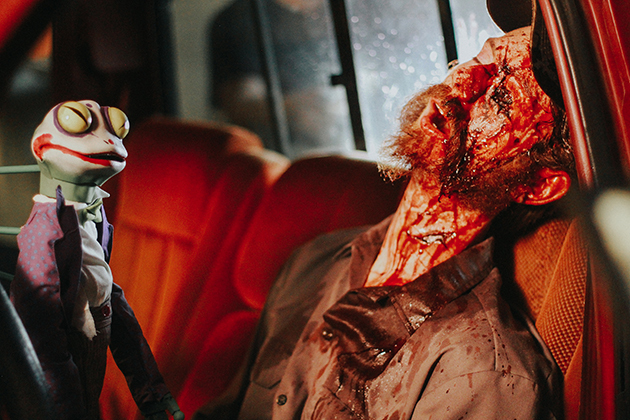 The murderous marionettes are back as Fangoria presents their ultraviolent reboot of Charles Band’s Puppet Master horror franchise, The Littlest Reich, from directors Tommy Wiklund and Sonny Laguna. When divorced comic book writer/store clerk Edgar (Reno 911!’s Thomas Lennon) finds one of the infamous Toulon Blade puppets in mint condition at his family home, he decides to sell it for some quick cash. New girlfriend Ashley (Jenny Pellicer) and nerdy pal Markowitz (Nelson Franklin) join Edgar as he heads to Oregon for an auction being held in the mansion where the infamous Toulon Murders took place 30 years previously. Joining old favourites, Blade, Tunneler, Torch (aka Kaiser) and Pinhead, in this 13th-entry are seven new deadly dolls, including Junior Fuhrer, a diaper-wearing baby doll with the face of Adolf Hitler, who takes possession of a blonde German muscle dude by ripping open his back and crawling inside so he can operate him like a real-life puppet. But the Nazi nipper does get his comeuppance when Markowitz throws him into an oven. 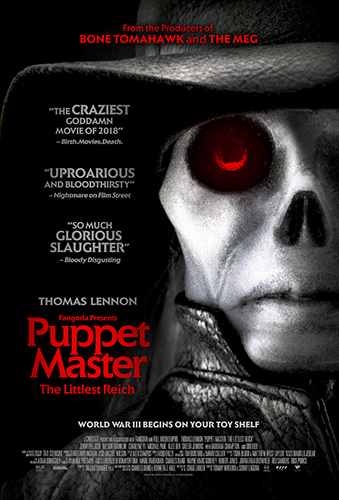 With a neat (though short) cameo from Udo Keir (as Andre Toulon), a terrific score from the legendary Fabio Frizzi and an ending that hints at the franchise’s return, Puppet Master: The Littlest Reich is a bloody, silly, fun ride indeed. 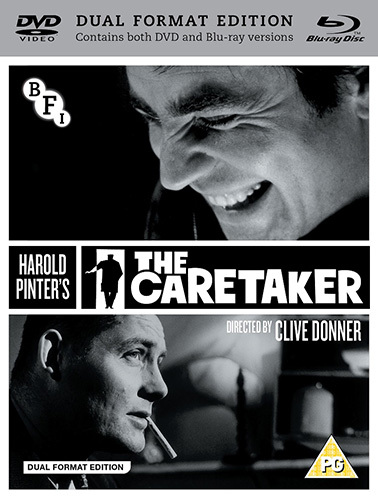 The Caretaker remains one of Harold Pinter’s most famous works. 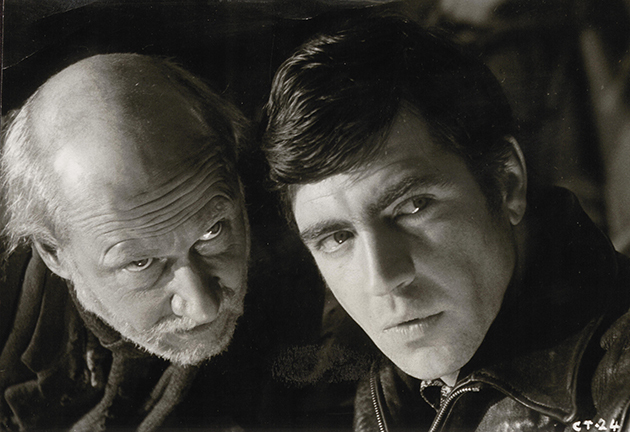 This study of shared illusion, tragic dispossession and the fraternal bond of unspoken love, combines the magic of Pinter’s dialogue with some mesmerising performances from Alan Bates, Donald Pleasence and Robert Shaw into a spellbinding film, sensitively directed by Clive Donner and shot by Nicolas Roeg, which is now out in a dual format release from the BFI, presented in a newly-restored print and with a host of extras (check them out at the end of this post). Harold Pinter was in the right place at the wrong time. A schoolboy witness to the World War II carpet-bombing of London’s East End, his response to such violence placed him as one of the angrier young men on the writing spectrum. By the late 1950’s he was well on the way to blowing the bloody doors off. The Caretaker was his first commercial theatrical success. Burrowing upwards through inner city post-war debris like a weed, spare, sparse, resilient, it debuted in April 1960 and was feted first off the Charing Cross Road later transferring to Broadway. Regardless however of such glittering cosmopolitan acclaim, the blunt 3 hander set in a single cluttered room remained very much grounded among the bricks and bric-a-brac of down-at-heel Hackney. 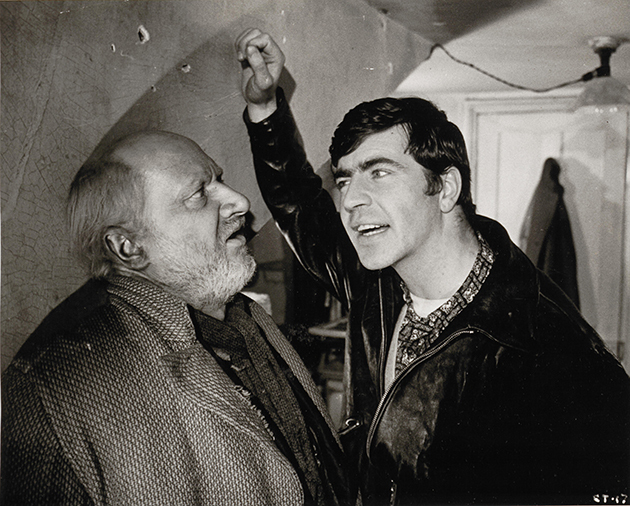 It was in this borough, where Pinter was born and schooled, that Clive Donner assembled an artist/actor collective and camera crew in late 1962, filming during the coldest winter on record. Underwritten with donations from British stars of stage and screen, the project was an early GoFundMe fifty years before the concept existed. Each benefactor supplied £1000. Twice that could get you a fourth floor bedsit in Islington within thieving distance of the library. There is little imagination required to explain the empathy behind Peter Sellers’ backing, solitary child of a nomadic theatre family whose shallow roots had dug into the similarly bleak soil of East Finchley. Noel Coward and Elizabeth Taylor’s subscriptions suggest some less personal forces at work. Shot entirely on location around Clapton, the outer parameters of The Caretaker are the distance a man could trudge from Mare Street in ill-fitting shoes. And no further. Despite the freedoms allowed by film at a time when it was not possible to get a van on stage at the Arts Club, even if had Pinter written one in, the piece remains chillingly claustrophobic. Three men, most usually in dual combinations and head-on, shuffle about the confined space of the upstairs bolt hole arguing status, standing, sheds, Sidcup and seagrass, never more than a few feet apart. It is a tale full of sound and fury. And in part seemingly told by a madman. One bitter winter evening, the homeless and dispossessed Davis is saved from a good kicking by a taciturn stranger, Aston and taken into his home. Initially disconcerted by the kindness, the tramp sets about negotiating residency in the rambling, ramshackle property in which, if care is taken, he may find permanent refuge. The garrulous and distracting Mick, Aston’s brother appears to offer alternative terms, although it’s a word game with much the same end. Amid the chaotic and haphazardly piled junk hoarded by Aston, an ice-cold stove dominates the room. Even if the window were not open, at times with the snow flurrying down outside, diffusing the stench from the unwashed vagrant, there is no possibility of warmth or comfort. “It’s not connected.” Explains Aston when pressed for a cup of tea. A lack of connection pervades. Very much more than the cooker appears isolated and without purpose. Aston has entirely withdrawn following a non-specific institutionalisation. The blistering details of his shock therapy are recalled in an uncomfortably invasive single shot. 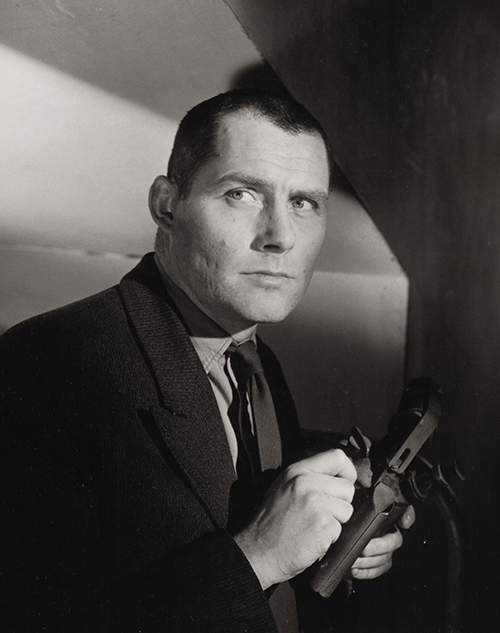 Actor Robert Shaw’s eyelids twitch as he stumbles over the violation at the hospital somewhere “outside London”. For a film in which site-specific references come along more regularly than the #30 bus (via Highbury Corner), with journeys “down the Essex Road to Dalston Junction” taking on a mythic quality and Micks’ knowledge of hump backed bridges on the A2 almost encyclopaedic, there is no safe travelling outside the room resulting in terminus nor arrival nor completion. An offer to drive to Sidcup and collect finally ”the papers” that underpin Davis’ inconstant grasp of identity sees Mick’s van swerving pointlessly around a circular layby, depositing the old man back at the bench from which he started out some half a minute earlier. 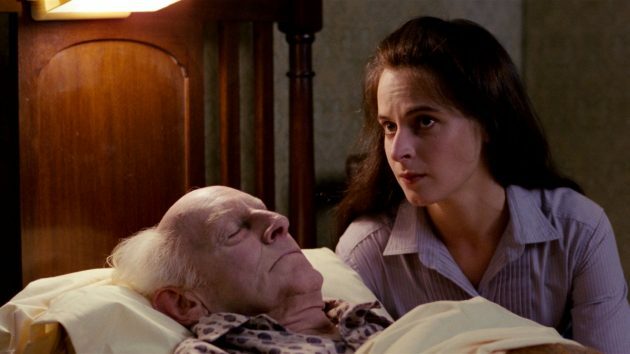 Where the film can free itself from the immediate physical confines of the attic, Donner does so with a delicate poignancy. On the page the brothers share only two brief scenes together tight amid clutter under the steeple eaves. On the screen they are granted a soundless and affecting moment of reflection above a frozen pond in a winter garden, seen from a distance, indistinct, and tellingly through glass, the sacking-draped top storey window serving to emphasise we look through a camera lens and not straight at a stage. The music too suggests an inhospitable landscape. Ron Grainer’s disconcerting soundtrack is high pitched scratching, screeching and oddly resonant metallic drips into a tin bucket tied to the ceiling. An echo of the bitter cold outside and in, there is barely a scene not underscored by grating electronic slides as if thin ice were cracking underfoot. Davis’ obsession with bags and boots, the detritus of a wandering street life calls to mind, inevitably, other tramps from drama of the period. But the nifty pace of Donner’s film, despite long low shots across bedsteads and pipes and years’ worth of newspapers bound in carefully knotted string, ensures we never focus merely on the hiatus. This is much more than a wait between pauses. 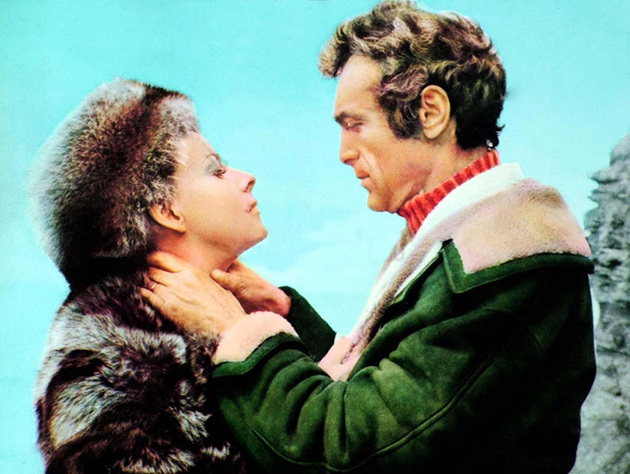 Donner’s low angles, the splintered lighting and unflinching close-ups are suggestive of a thriller. 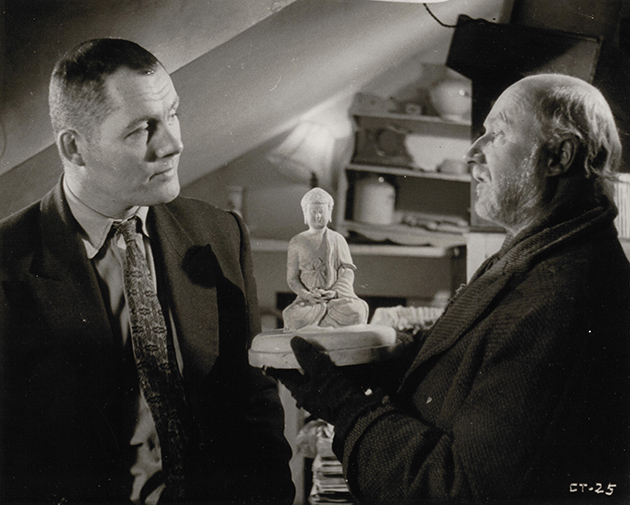 Of the three actors, Pleasence, Bates and Shaw, the two former had developed their characters in The Arts Theatre in 1960 and taken them right across the Atlantic. The film-set off Lower Clapton Road must have felt like a homecoming. 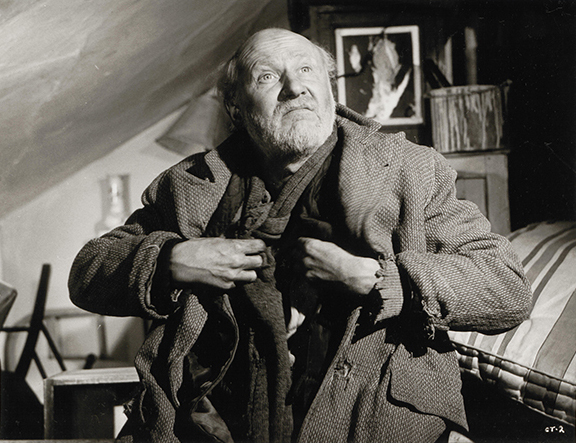 Pleasence, at forty-four some thirty years younger than the vagrant he portrays, is bundled in patchwork layers of castoffs and coats. Davis resembles nothing more than a tatterdemalion onion, the peeling of which may lead to a concrete identity thus saving the bother of schlepping to Sidcup. Fear of the foreign, fear of the other and fear of each other all collide in The Caretaker. 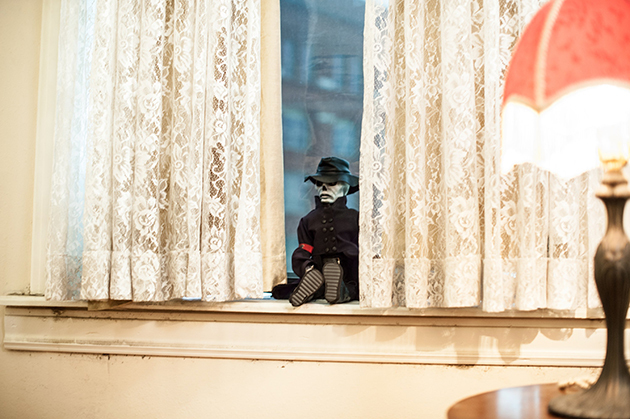 The film is an unsettling watch catching an unsettled time. The 60’s were not yet swinging but the oddly visionary consortium backing the production, Peter Hall and Richard Burton by no means the least likely pairing, suggest a pendulum movement starting to oscillate. Grainer, the composer of the shard-shattering and unsettling falls was already tinkering with the theme for a forthcoming BBC series. The pilot show in autumn 1963 would feature another ungrounded senior gentleman of dubious provenance and a box smaller on the outside. Shuffling through freezing early dusk, passing the time that would have passed anyway, Davis is illuminated in the doorway of the Hackney Empire theatre, a welcome blaze of light in a feature lit for the best part by a single bulb on a wire. The back bar where some years earlier an out of work writer named Milligan had encountered a barely in work radio actor named Sellers and comedy history began a gestation. The Caretaker formed in this crucible, penned by the master of the theatre of menace, part financed by a Goon, scored by the genius who could hear the sound of a TARDIS barrelling through time. Director Donner’s brief was to run with it. He didn’t go far. Balls Pond Road was the outer limit. This glorious restoration reminds us that expansion need not be dilution. In the hands of an inventive creative (and there were enough involved as a stills photo of Noel Coward hemmed between lighting gaffers on the set sofa bed during production reminds us) a piece so static and rooted and constrained can soar with effortless flight well beyond the derelict geography. An early and brilliant example of thinking outside the box (room). 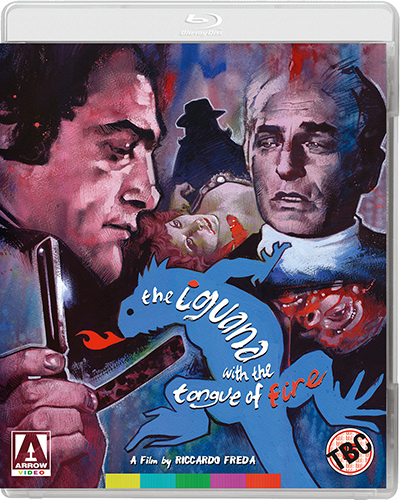 Talky and torturous, with a totally nonsensical plot, Riccardo Freda’s The Iguana with the Tongue of Fire (aka L’iguana dalla lingua di fuoco) is one of several ‘animal-in-the-title’ giallo cash-ins released in the wake of Dario Argento’s The Bird with the Crystal Plumage and now heads to Blu-ray courtesy of Arrow Video. Set in Dublin, it opens with an acid-throwing, razor-wielding maniac viciously slaying a young woman. When the victim’s butchered corpse is discovered in a limo owned by Ambassador Sobiesky (Anton Diffring), a police investigation is launched. It turns out the murdered woman was the Ambassador’s lover, but Sobiesky refuses to cooperate with the police, claiming diplomatic immunity. Now I’m not sure whether director Riccardo Freda was just having an off-day when he was making this or whether he decided to say ‘to hell with it’, let’s play fast and furious with giallo convention and spoof the genre, but Iguana is a confusing mess of a film. Shot with a tourists eye on Dublin’s iconic O’Connell Street and around the Cliffs of Moher in County Clare (acrophobiacs beware), and featuring overblown (vocal) performances from the likes of Valentina Cortese (who plays Sobiesky’s glamourous wife as if she were Gloria Swanson’s Norma Desmond), plus a rousing score by Stelvio Cipriani, Freda’s luridly over-the-top murder mystery is, bizarrely, also quite mesmerising. I just got carried away by the visuals, the score and the rather disturbing death scenes. I particularly loved how Cipriani introduced crashing instrumental sounds every time there was a close-up of a pair of glasses or a cigarette lighter. Intentional or not, it’s quite hilarious in a Garth Marenghi kind of way – as is the explanation as to the film’s title (you have to hear it to believe it during a scene between Norton and a shrink). Now, you can experience Iguana yourself with Arrow Video’s new Blu-ray release, which features some excellent extras. My personal favourite was Lovely Jon’s featurette on Cipriani, which has spurred me in tracking down the composer’s other scores (there’s quite a few) iincluding this film’s score which Arrow are releasing on purple vinyl; while I had to laugh that even academic Richard Dyer found the film as messed up as I did. 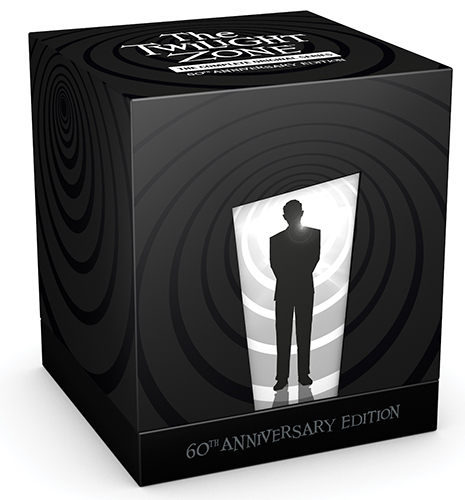 2019 marks the 60th anniversary celebration of Rod Serling’s original Twilight Zone TV series and on 15 April, Mediumrare Entertainment is releasing an exclusive limited edition Blu-ray box set in the UK, which will include all 156 episodes of the original classic cult TV series, which was first broadcast on 2 October 1959 and ran for five seasons. Included in the box set are a host of goodies, including an 80-page companion book written by Marc Scott Zicree, a 60-page episode guide, two reproduction Gold Key Comics, two post cards. 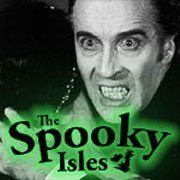 There’s also a host of extras (including audio commentaries, interviews, vintage radio dramas and the unaired pilots), plus a bonus disc which includes a new biography of the show’s creator, American Masters Presents: Rod Serling Submitted for Your Approval, and a new documentary, Timeless As Infinity: Entering the Twilight Zone, featuring interviews from Serling’s family, as well as interviews from the likes of Wes Craven and Joe Dante. 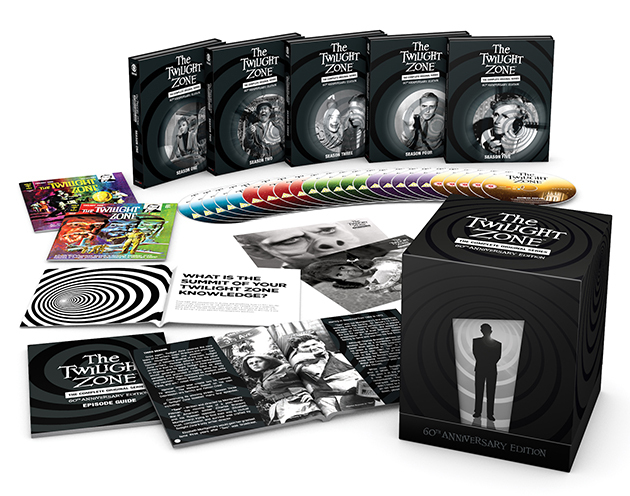 The fifth dimension has never been better than with this bumper box set on one of the most unique and inventive television shows ever created. 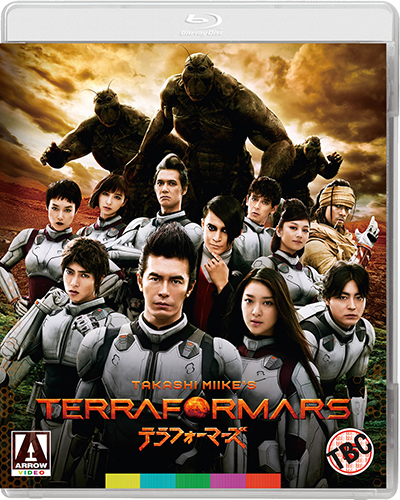 The ever-prolific Japanese film-maker Takashi Miike (Audition, Blade of the Immortal) returns with this intergalactic epic in which a team of space explorers find themselves pitched against a horde of oversized anthropomorphic cockroaches. 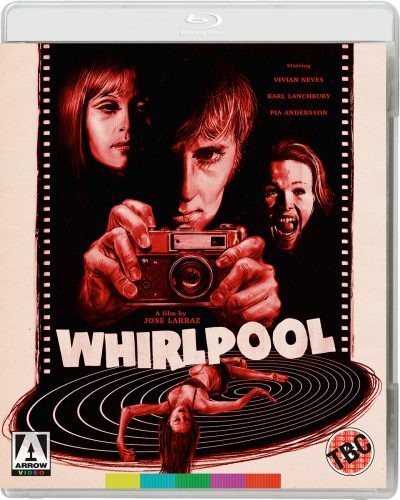 In Larraz’s debut feature, the hitherto ultra-rare Whirlpool (1970), Vivian Neves stars as Tulia, a young model invited to a photographer s secluded country home for what purports to be a quiet weekend retreat – but soon transpires to be anything but. 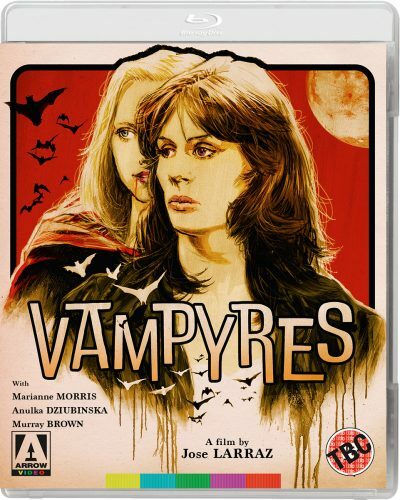 1974 s Vampyres – perhaps the best known and most widely-released of all José Larraz s films – sees a duo of blood hungry female vampires prowling the British countryside, from where they lure unsuspecting male motorists back to their imposing, dilapidated mansion for draining… in more ways than one. Meanwhile, in 1978 s The Coming of Sin (La Visita del Vicio, in its native Spanish), a young gypsy girl experiences a violent sexual awakening as her dreams of a naked young man on horseback become reality. By turns terrifying, titillating, artful and scandalous, these three films collected here – all newly restored from original film elements, with Whirlpool and The Coming of Sin making their Blu-ray world premieres – collectively offer film fans a unique perspective on the fascinating, highly-varied career of one of the horror genre’s most-overlooked auteurs. 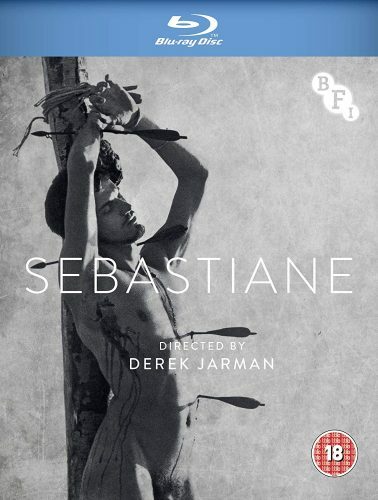 Derek Jarman’s first feature, Sebastiane, directed with Paul Humfress and released in 1976, presents the controversial, sensual and sexualised story of the 4th century Praetorian Guard whose human goodness leads to humiliation and martyrdom. On 18 March 2019 Sebastiane comes to stand-alone Blu-ray for the first time in the UK, and iTunes, released by the BFI. Extras include Sebastiane: A Work in Progress (c1976) and The Making of Sebastiane (1975) and an illustrated booklet. In Sebastiane, the heat of the Sardinian desert is powerfully captured on film – both cast and crew go through their paces, sweating it out Herzog-style – while Brian Eno’s distinctly moving score beautifully complements the superb framing and stunning slow-motion photography. 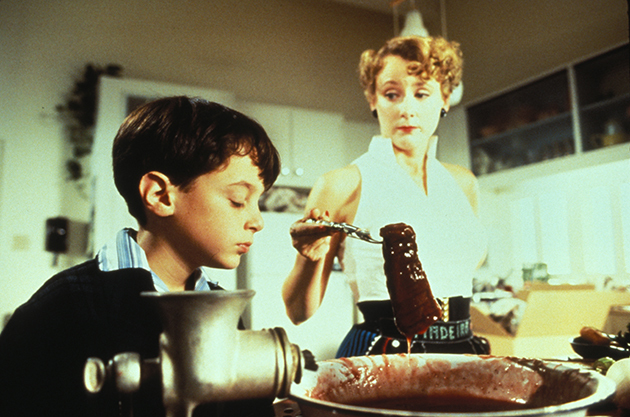 Parents (1989) | A grisly slice of 1950s American suburbia that’ll put you off meat for life! 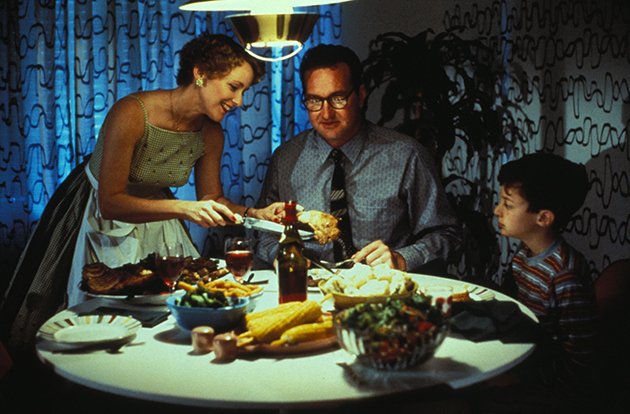 Horror comedies come no blacker than this tale of friendly neighbourhood cannibals (Randy Quaid and Mary Beth Hurt) at large in the America of the 1950s. 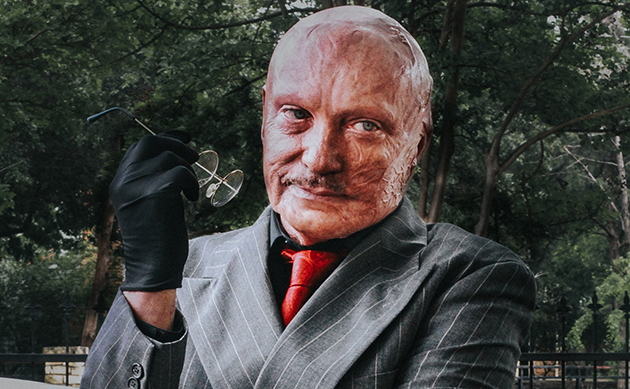 Imagine an old Bisto advertisement turned into a horror film and you’ve got a good idea of what to expect from director Bob Balaban’s highly effective little shocker.